Toornament can not provide access to Fortnite Custom Games. If you can not create Custom Games on your own, you are going to have to wait for them to be available for everyone. 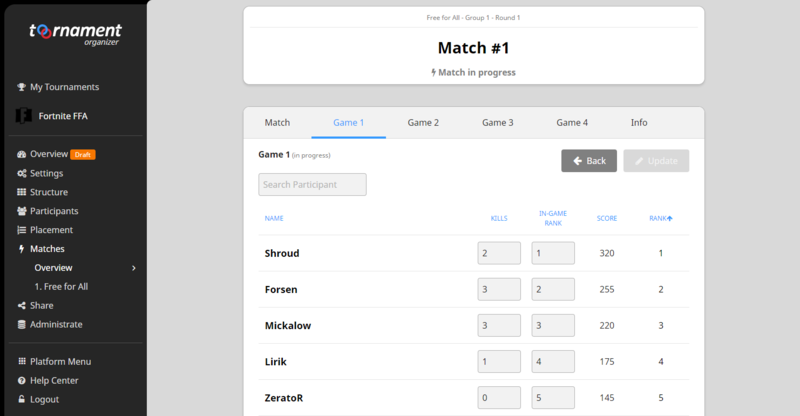 From your Organizer dashboard, create a new tournament and pick Fortnite as discipline! If it's your first tournament, you may want to read our Starter Guide on how to create your first tournament. Your first step is to determine the ruleset you are going to use in your tournament, by going to "Settings" -> "Match". The Fixed Games (Advanced) format has been tailored for Battle Royale games like Fortnite, and it will be the one selected by default. 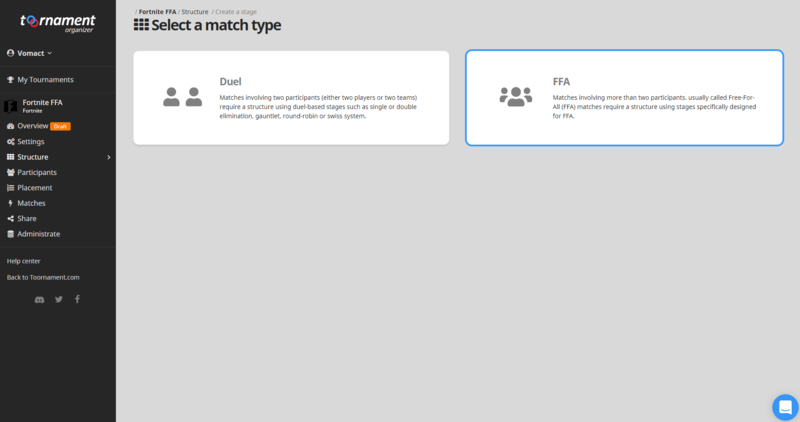 Moreover, this Match Format is already all set up to allow you to start right away! If you are not sure about the way the Advanced Settings work, you should leave the options and checkboxes as is, and only change the points values to your liking. You are going to need at least one FFA Stage (either a Simple Stage or a Bracket-type FFA Stage) to accommodate the players taking part in your matches. Go to the Structure menu and create a new one. All you have to do is give a name to the stage, set how many participants will take part in it and how they will get divided into matches or groups, and you are good to go!. With hundreds of participants in each match, we strongly suggest you use the Registrations to create your participants. Don't forget you can use the Custom Fieldsto gather information about them. Now that your tournament is all set, and unless you wish to keep it private, you have to publish it so everyone can see it!. Don't hesitate taking a look at our Share category for tips and advices on how to put your tournament under the spotlight! Participants will register to your tournament, and you will then have to validate them. You may then place them in the different matches you created earlier. The Simple Stage works just like any other stage, following the general Placement process.. When the match starts, you can go to the "Matches" -> "Name of your Simple stage") menu and start entering ranks and kills of the participants. It will update the rankings live! All you have to do is enter the Rank & Kills of each participant, during or at the end of the match. The system will do the rest, and calcualte their points in the game, and use it to calculate the global match score and ranking. Your Fortnite tournament is now going on nicely! Make sure to enter all participants' performance for the match to validate, and determine your tournament winner! If you wish to have a more complex structure, with several qualifying matches leading to a finals for example, you just have to create more stages, and rename them accordinly! For our organizers that are also developers, we have our free and open API aimed at improving your video and/or stream production! You can get detailed results, and use them to create statistics and tell stories about your competitions! It can also be used to create nice visual assets, like tournament infographics, just like what was done for the Just Dance World Cup.